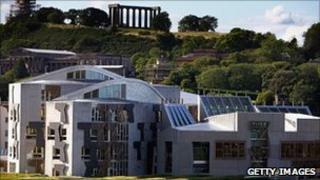 Future Scottish parliament terms could last five years instead of four, the deputy prime minister has said. Nick Clegg said Holyrood could hold the 2015 Scottish election a year either way of the date to avoid a clash with the UK general election. The UK government offer came in a letter to the Scottish Parliament's presiding officer. The proposal would mean the contest could take place anytime between May 2014 and May 2016. Nick Clegg told the BBC: "We are now giving Holyrood the complete freedom to decide, by a particular majority, to change the date - either bring it forward to 2014 or defer it to 2016. "And we are doing that in a spirit of respect - respect for those strongly held views across all parties in Scotland, so that Holyrood can decide for itself when the election after next will occur so we avoid this clash from arising in the first place." Mark Harper, minister for political and constitutional reform, said: "This follows several months of dialogue with the parties in the devolved legislatures. "They have asked for this power and we think it is right to give them this choice." MSPs will now be asked to consider the issue, but will be required to come up with an answer before parliament is dissolved in March for this year's election. If the decision were taken to move the Holyrood election to May 2016, it could set up a potential clash with local government elections in Scotland that year.